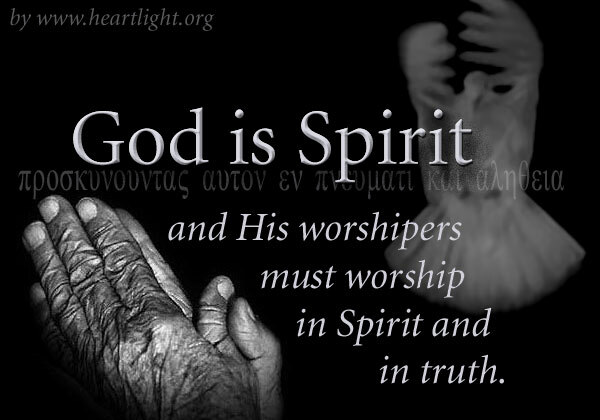 God seeks true worshipers. He seeks those who long to praise him authentically and spirit to spirit. To help us in our quest, he gives us his Spirit to help us worship (Philippians 3:3; Jude 20; Romans 8:26-27). Most of all, he wants us to genuinely worship him — worship him according to his will and with all of our heart. Loving Heavenly Father, thank you for your Holy Spirit who is interceding even now to perfect this prayer. My heart thrills at the knowledge that you not only know me, but that you desire me to come into your presence. Please accept my feeble words and hear the emotion of my heart as I say "Thank you!" for all you have done for me. In Jesus' name I pray. Amen.